Back in 2004, I was asked to review the very first Hercules DJ controller – one of the first DJ controllers ever made – which was a tiny device not dissimilar in looks to the Hercules DJ Control Instinct, which we look at today. Despite having no sound card (so no headphones) and some pretty serious design misgivings, that little controller was what got me hooked on digital DJing. Now nearly a decade later, we have the latest little baby in the company’s range to look at. It’s tiny! It comes in a little box and is no bigger than a paperback book. 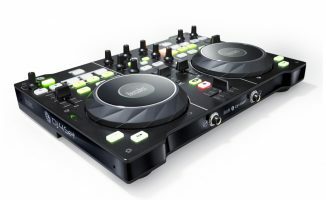 Lightweight and in a mixture of glossy and matt black plastic, it hat two shrunken, clunky jogwheels, three faders, six knobs, a couple of paddle controls, and 35-odd buttons. There are 1/8″ TRS sockets front and back for headphones and speakers respectively, and also twin RCAs at the back for speakers. It has a hard-wired USB cable. Four big, shallow rubber feet hold it steady on your surface. While it’s completely plastic and plainly consumer-oriented, it’s perfectly well made for what it is. It feels like it will last for a long time, and at least the fact that it’s black means that it looks only partly toy-like. The supplied software is called DJUCED, which is not one of the big DJ software brands. Indeed, currently, it’s only available with a couple of Hercules DJ controllers. You install it from a supplied CD. In fact, you have to install the Hercules drivers (it annoyingly installs drivers for every Hercules controller – bloatware alert!) and the software separately, something the instructions don’t make clear. Once you’ve jumped that hurdle, though, thankfully everything else is set up for you on opening the software, which means when you plug your headphones in they work as they should, and when you plug your speakers in they do what they’re meant to. Far more respectable DJ software brands can’t get this bit right, and it’s a major stumbling point for countless beginners, so well done Hercules and DJUCED. With only three knobs and three faders, of course, this is going to be DJing stripped back to its bare basics. Here’s the good news: You can DJ perfectly well on this. The responsiveness is good, the jogs scratch and nudge reasonably well (although you can’t do spinbacks, turntablists, because when you remove your hand from the jog, it loses scratch functionality), the cue/play/pause buttons are responsive, and the sound quality is fine. By “fine”, I mean that it is perfectly acceptable for anything anyone is likely to throw this controller at (you’re not planning on using it in a superclub, are you?) and that the keylock and beatlock algorithms are as good as the majority of the competition. 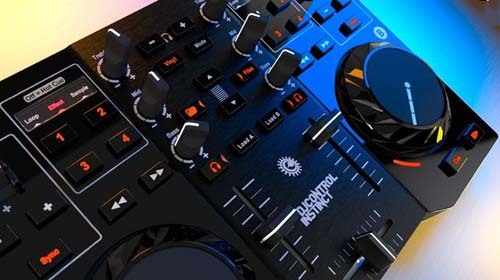 A couple of functions that would have knobs on bigger DJ controllers have a pair of buttons instead, specifically library scrolling and headphone volume. While this isn’t ideal, it’s not a dealbreaker. One compromise that is a bit more worrying (but that is understandable) is the use of paddles for pitch controls rather than sliders. Truth is that 90% of users of such a controller will use the “sync” button to match the speeds of their tunes, so won’t need to use these controls at all. But if you do want to manual beatmatch on it, they’re a poor option. It’s possible, but it won’t be as easy. Likewise, while the DJ Control Instinct has access to hot cues, loops, effects and even samples in the software, you need to cycle between functions to make the same four little buttons work with all of these functions. Forget to switch to “loop” before hitting the loop button, and you may just accidentally hit a hot cue and completely wreck your mix. The jogwheels worked better than I initially guessed they were going to. Unlike most brands, they’re mechanical – pressure rather than touch engages the scratch mode. This works well, and apart from the aforementioned inability to perform spinbacks, they do the job. And I’m happy to report that unlike the play/pause and cue buttons on that Hercules controller I reviewed all those years ago, the buttons here are sure and responsive. There’s no auto gain on the software plus no gain knob on the controller, so that means that to get the levels right you may sometimes have to use the mouse. Overall, the controller has limited buttons and functionality, but what it does it does OK. It’s not the most fun or the easiest to use for these reasons, but can you DJ on it? Yes. In a break from tradition (tradition being “throw Virtual DJ LE in and be done with it”), this controller comes with a fully functioning version of its software, DJUCED. Firstly, it’s good that the software works fully. Often you get LE software that means you have to pay more to get all the functions. Beginners often don’t understand enough to know what they’re actually buying, and equally, they tend to expect what’s in the box to work properly without more financial outlay. This software does work fully, the only caveat being that the controller needs to be plugged in and that the software only works with the controller you buy it with. Seems a better arrangement to me. So what’s it like, quality wise? 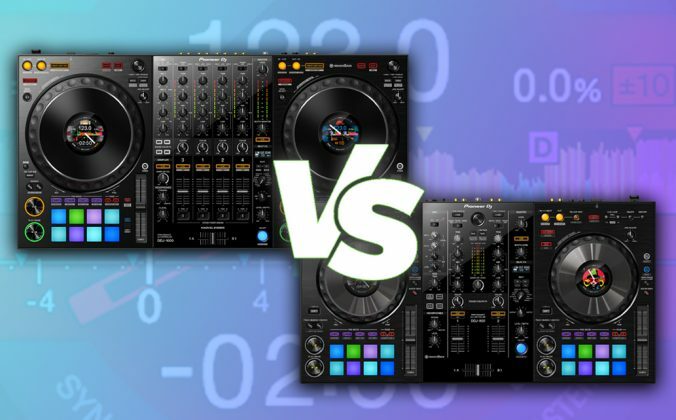 Well, the “big three” – Traktor, Serato and Virtual DJ – have spent considerable time and money getting their products to the mature states they’re at now. DJ software is daunting stuff to get right and is far more important than hardware when it comes to what you can and can’t do as a DJ. The fact that DJUCED is even anywhere near these guys (which it is) is praise enough. 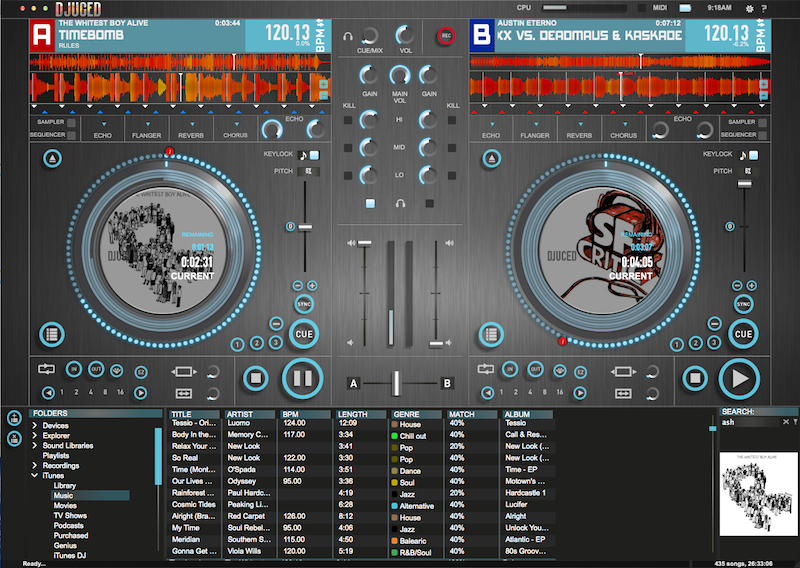 It has nice touches: the visual waveform beatmatching system is intuitive (two little triangles under each waveform that show how well lined up the decks are with the other deck, plus a coloured background that snaps in when the decks are in sync); there are concentric circles around the decks to show each minute of the song, with markers for cue points and looped sections; the on-screen VUs show track gain, not master gain, which is better for setting your levels when DJing; the search function is instant, and works well; and as well as reasonable hot cue and looping features, there’s a sampler/sequencer too. Sampler and sequencer? Yup, there’s a simple four-bar sequencer that lets you piece together up to four elements (there are four sample slots) per deck. It comes loaded with a (completely inappropriate) rock drum kit, but you can easily enough grab loops from your music and load them in. It would be good for quick vocal snatches, sampling rhythm patterns etc, and is a good place to start learning about sequencing. The sampler itself is simple but can handle one-shot and loops. Each sample deck/sequencer section is tied to a software deck, so the crossfader turns both off at once as you mix out of a track into another. The effects are basic and quite weak: The hi and lo-pass filters seemed to be either “on” or “very on”, and I couldn’t get any time adjustment on the echo, for instance, but you get the basics for splattering a little extra something into your mixes. There are other anomalies. For instance, it’s not possible to hear the track while moving quickly through it, which is weird. Another? The manual pitches (those little paddles) repeat like a key on your keyboard: You hold it, it moves one step, waits for a second, then repeats rapidly. This felt bizarre in use. 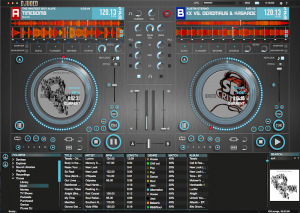 Overall, though, the software is a decent stab, and it’s certainly possible to perform all the basic DJ techniques on it. There’s also plenty here to keep you amused when you want to try more ambitious stuff, although as you get better you’ll feel its limitations. It’s not up there with the big boys, but you won’t be made to pay again, and it won’t stop working fully after a month. 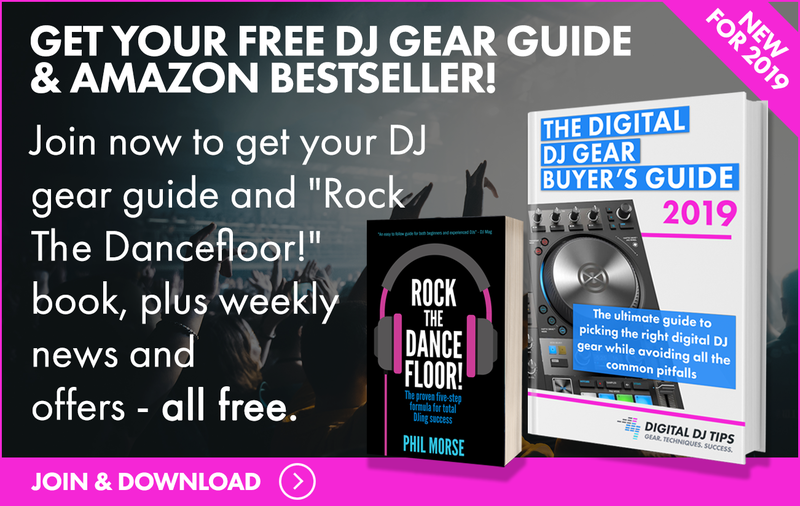 Want something you can learn about DJing on, for the lowest price possible? This will do the job. It has an acceptable soundcard built in, it has full software, and it has all the controls you need to learn the basics. Add a pair of cheap powered speakers and some budget headphones and you’ve got all you need. 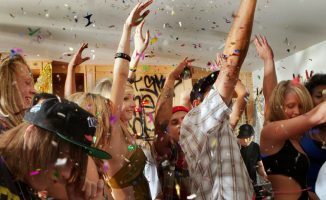 For me, there’s an acid test: Our How To Digital DJ Fast video course teaches you all the necessary skills so you can DJ in public, from scratch, in a month. Could you complete that course and play your first gig using this controller? Yes. Want something you can learn about DJing on, for as little as possible? This will do the job. It has an acceptable soundcard built in, it has full software, and it has all the controls you need to learn the basics. Once you’ve got to that point? The fact that the software is non-standard, and that some of the controls here are very basic (or just missing entirely) means that you’d quite quickly want a better controller, so at that point, you’ll be looking at a new software solution too. And yes, it would be slightly easier to learn to DJ on more expensive gear. But I learned to DJ on cheap belt drive turntables and a mixer that didn’t even have a crossfader. I was talking to a scratch DJ the other day who told me he learned to do DMC-standard scratch routines on two turntables ripped from 1970s music centres. I keep coming back to this, but the truth is that DJing is not the gear, it’s the music. It’s not the software, it’s the guy controlling it. You could produce perfectly fine DJ mixes, and even play parties and bar gigs quite happily, using the DJ Control Instinct. And if you then decided DJing wasn’t for you? Well, you’ve really not lost much finding out, have you? 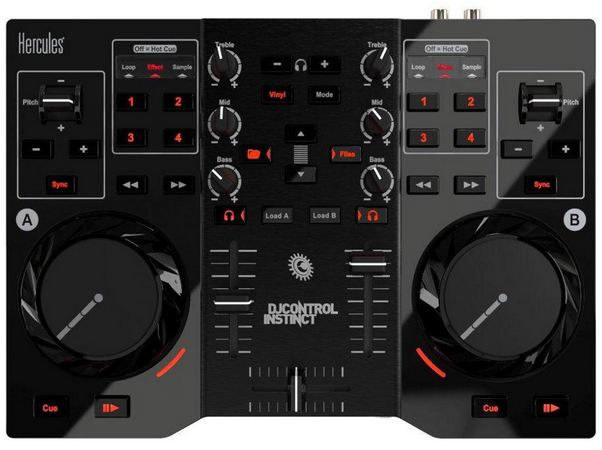 Do you like the look of the DJ Control Instinct? Have you got one? 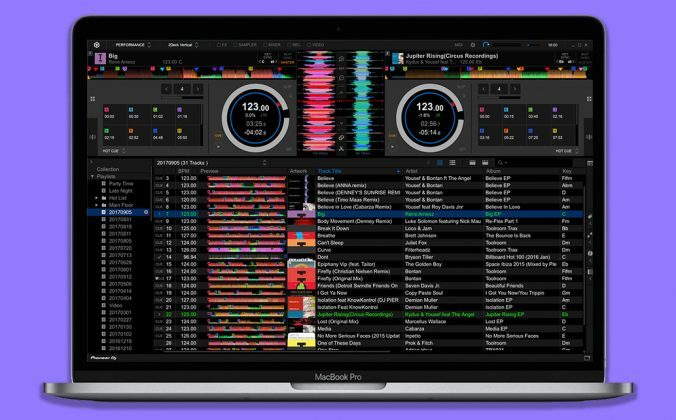 What do you think of the DJUCED software? Please share your thoughts in the comments. 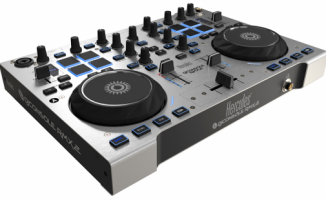 First Review: Is The New Hercules DJ 4Set a Mixtrack Pro Killer? Yes, in that instance I think it’d be perfect. Tiny and light, with decent soundcard and OK response? I don’t see the notes. 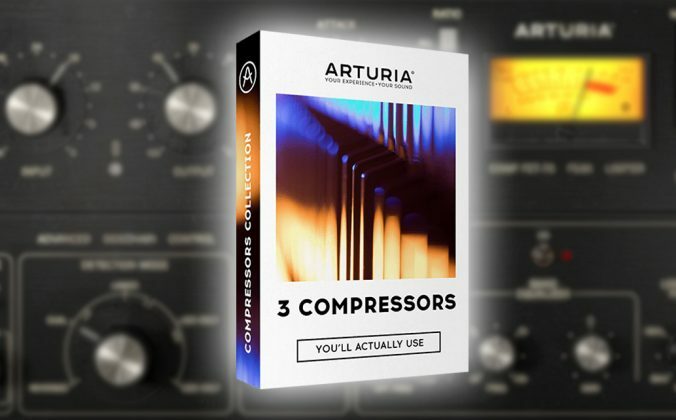 Can you harmonic mix with the software? Yes, you can do harmonic mixing with it. If you load a track to deck A or B, below the bpm display is the musical key of the song. Anyway, I use Mixed In Key to detect musical keys. Mixed In Key writes them to the “Comment” tag of the MP3s and you can add the Comment column to the list view of DJUCED. I think that in about 6 months most of users will sell them on ebay for a half of it’s original price. Can other controllers be used with the software at the same time? Like could i jack in a nanokontrol to take care of some of the other functions? There is a mapping section on the software, although I didn’t investigate it. But the software definitely needs the controller to be plugged in to work. One for the Hercules forum I’d say. It looks like a pretty good set up to see if DJing is your thing. Thanks for the update. Serato does it too for ITCH (hence you get loads of Numark stuff installed when you add a Vestax controller). Personally I don’t like it as your choice of controller brand may be arbitrary and not a statement of loyalty for life. Good work re the pitch lever setting – wonder why it isn’t set in the best way (as you outline) straight out of the box? For me its again the most interresting part the price. Why does the so called PRO mixers cost like 10-15 times more? Made of gold??? Hopefully price will go down as more amateur models get better and better. The question then is more if you feel cool enough playing on Hercules or other “cheaper” brands. In nearly every single way, a pro DJ controller is vastly superior to something like this. That doesn’t mean this doesn’t have its place, but that “you get what you pay for”. Having said that, some more expensive gear is better value than other. I’m definitely not a gear snob. I feel just fine when using Hercules gear in public. I currently use a Hercules Control MP3 E2 just for messing about at home with. Other than the internal soundcard, would there be any major differences between the Instinct and the MP3 E2? No, I wouldn’t change if I were you, especially if you already have an external sound card. How loud it is depends what speakers and amp you plug it into! I have just used the Hercules rmx in the club for the first time, plugged into the mixer of a pioneer which was plugged into the clubs house system (8 speakers and a sub). I had to push the volume up quite significantly to reach the level needed for the club and even then I needed more volume but would have been dancing in the red. Are there other midi controllers that can provide more oomph? I am afraid to use this midi in the club again due to fear of blowing something. Thanks. Yes, you should be able to just set your computer’s audio drivers in the settings, though I can’t recall for sure as we’ve no longer got this in the workshop. go to the DJCUED website and ask on their forum for a definitive answer. 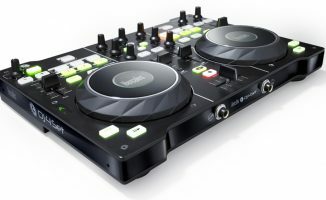 Hi phil, i recently purchased some numark cdj’s and mixer and im trying to learn to mix that way but i would also like to learn how to mix digitally and this controller seems ideal. Would your ‘how to dj fast’ tutorials be easy to follow using the hercules instinct controller? Yes, they’re designed for all software. OK, so do i need to plug my speakers directly into the console or will the sound just play from my speakers being in my PC as normal? You need to plug your speakers directly into the console. Hey! I just started this dj thing and i recently bought the hercules dj control instinct, im pretty happy with that but i have one problem and i tried in almost every single dj software and it kept giving me the problem that is that i can’t preview the next song on my headphones. I’m not supose to hear the next song in the headphones before it goes to the speakers? and yes im cliking in the button that has the headphones but it stil kept not working, what do i do? You need to set your audio output routing correctly in the software, and make sure you have the correct drivers installed. It’s the trickiest part of setting up DJ controllers, but it’s always explained in your manual. Go back and look closely at the steps they tell you to make, and ensure you’ve followed them all. In DJUCED, go to Settings (small cogwheel in the upper right corner), select “AUDIO” and make sure the headphones drop-down is set to “Outputs 3&4”. Hi! First of all, sorry about my english, I’m Spanish but I’m following your web this days and It’s awesome, congratulations! I’m introducing myself on the DJing world, and I wanted a cheap DJ control but I’m not an expert on this field. Would you recomend me the dj control instinct or the dj control air? Is it worth it to spend more money only for the pads of the control air? 1) Is it possible to connect the console somehow via external sound card like Sound Blaster X-Fi (hardware planned to use: notebook, console, external sound card, amp, speakers)? 2) Can I use a microphone with this console? 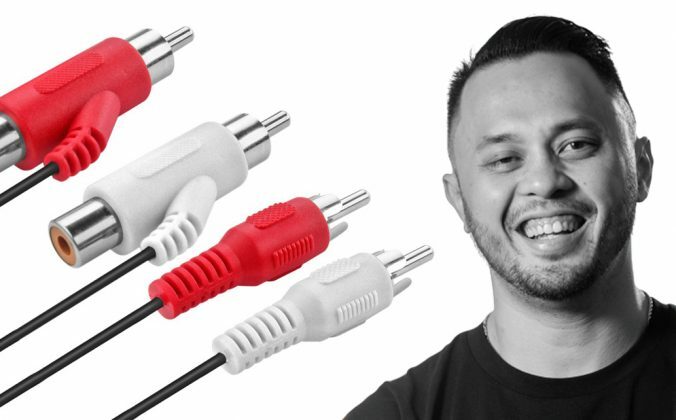 I would like to connect it to the notebook speaker/microphone jack. Will this work? It has a sound card built in, why do you want to use an external one? No, it won’t be easy to add a mic that way. just bought a hercules dj controller mp3 e2 for my son and there doesnt appear to be anywhere to plug in a microphone. does anyone kknow if it will work through the computer so he can talk over the track?? I don’t have a clue! No, unfortunately that’s not possible. im 18 and really interested in getting into the djing world does this controller worth it? i mean i see is pretty basic, im not looking forward to play in a night club or a concert with this but liek for Little clubs and parties Works fine? i do have a profesional sound system with very nice mixer where i can plug in the mic and control the sound quality ver well so i think that might help right? loved your review however I have a question, as you know controllers audio output always seem to be softer than CDJs or Vinyls. Just curios as to how loud this midi controller output is?? Would it be louder than a generic 7.1 channel usb sound card. Loud enough, about the same. Hi there ! i use a software called club pro dj vj & i was wondering if the hercules dj controller instinct will work with it ? any help would be greatful . thanks for your time & help . 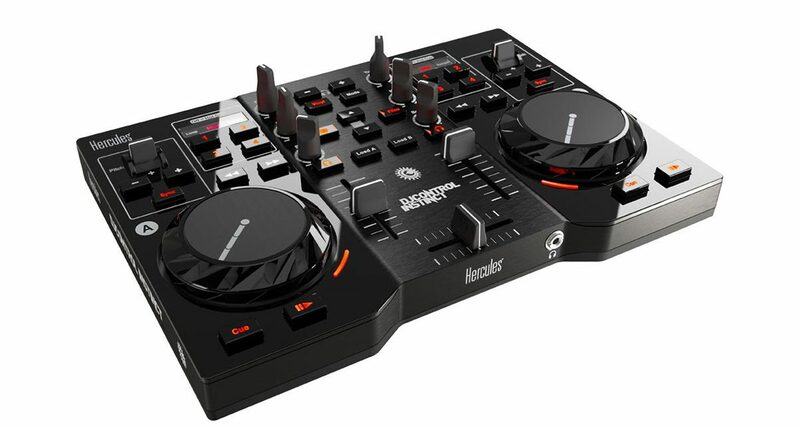 I am comparing several controllers as I am just getting started DJing and I am considering purchasing this controller. The fact that it has a sound card already built in which allows headphone previewing is a plus for me, but just to confirm, it is not possible to use a mic with this controller? i love this controller, great for me (a beginner) and i have played at quits a few of my friends party’s. Hi there ! does anyone know where a full version of djuced can be got from ? as i have been on there website & all of them are just 30 min demos ? any help would be greatful . Good day! 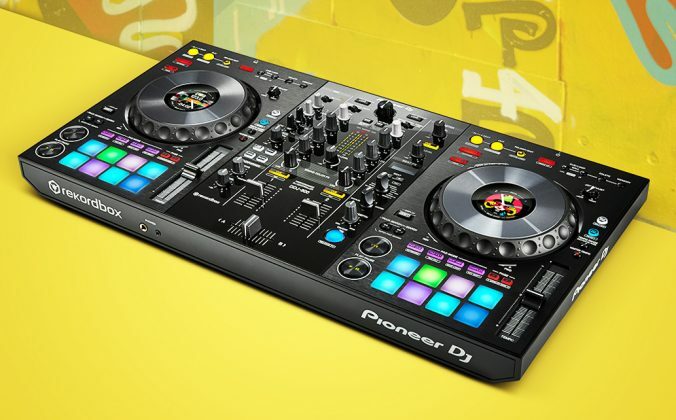 i am planning to buy this controller..
its working in any virtual dj version?? I have Virtual Dj Pro, but it don’t work with the instinct. This controller works with Virtual DJ Pro. Version 7.3 and up have native support for this controller. If you purchased a legal copy of Virtual DJ you can download the mapping file from their website. 1- Does the Hercules Air too have a built in sound card? 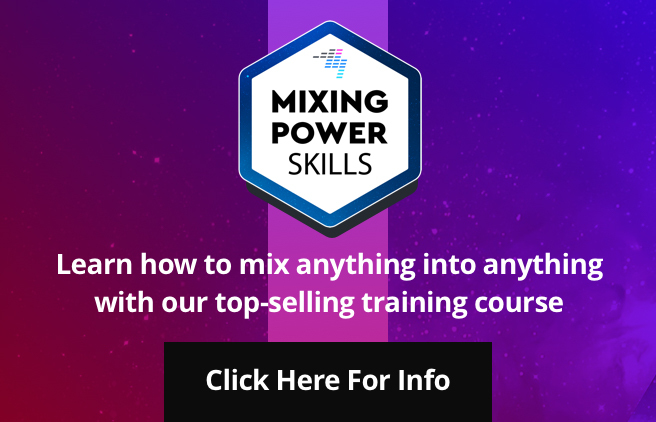 For beginners mixing and stuff. They both have a built in sound card. This one is a bit bigger and so probably easier to use. i have been using this controller for about 4 years now between jumping on pioneer controllers and cdj’s with added mixers and this little thing is good but. is there any way to add additional and controllable effects to the software. Hi!Nice review! Which choice do you think is best? Hercules dj control instict,Hercules dj control air or dj tech i mix reloead mk 2? My grandson got a Hercules DJ Control Instinct USB DJ Controller for his birthday. My laptop asked him to put in the CD he got with his controller. Either we did not receive one or it got tossed accidentally. Where can we get another one?